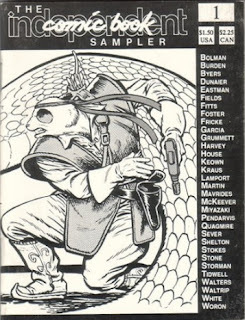 The Independent Comic Book Sampler was a 2-issue mini-comic series, both issues released simultaneously, that spotlighted various indie comics creators and their projects. Most of each issue consisted of half-page biographies with addresses on the bottom so readers could order books from the publishers. Other contents included pin-up art and short comics. 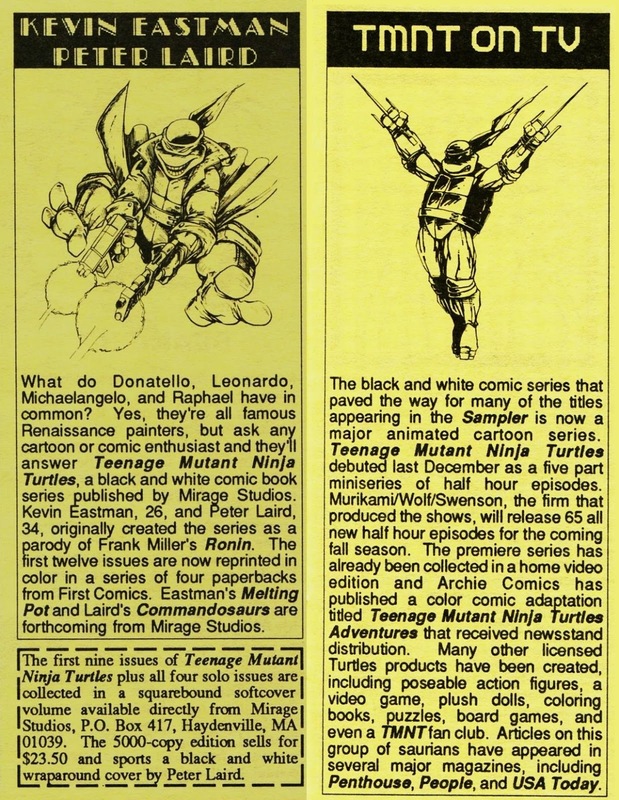 Although Eastman and Mirage are mentioned in issue #1, there is no TMNT content. 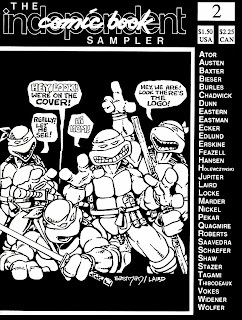 Issue #2 features an original cover by Eastman and Laird, a Barbarian Turtle pin-up by Eastman, and two blurbs about the TMNT (one about the comics, one promoting the cartoon). There is no original comic content. *Both issues were limited to 4000 copies each, with 50 of each being individually numbered limited editions with green covers. 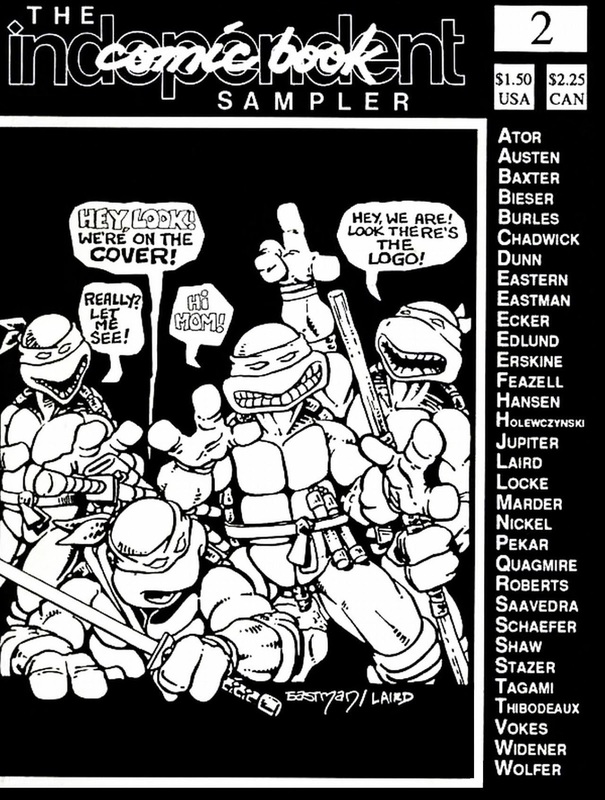 *The Eastman and Laird cover was reused, with new lettering, as the inside cover of the fifth printing of TMNT (Vol. 1) #1 (released August, 1988). How can I even review something like this? 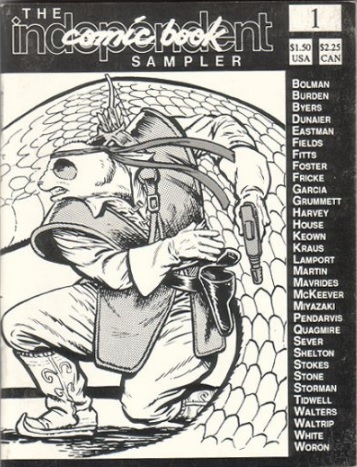 It's pretty much just an ashcan mini-comic that barely qualifies as a mini-comic. It's more like a catalog to help consumers get in touch with the creators or publishers of independent comics so they can order back stock. It wouldn't be worth mentioning if it weren't for the original Eastman & Laird cover. 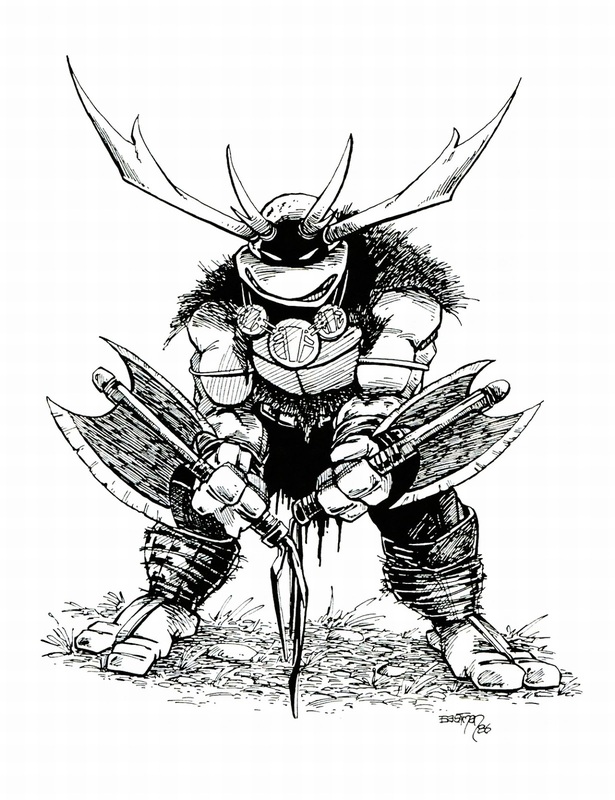 And I guess the Barbarian Turtle pin-up that made it's first appearance here (it would get recycled as bonus content in a lot of random books later on; you've probably seen it by now). One would think the Nick series would leap to use Panda Khan, as he'd fit with their template rather well in light of Tiger Claw and the impending arrival of Alopex. "Articles on this group of saurians have appeared in several major magazines, including Penthouse, People and USA Today." That's quite the trifecta. 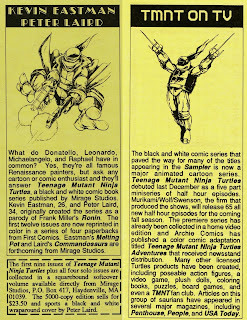 Or should say, "the Turtles have been featured in Penthouse?" Huh, that's a sentence I never thought I'd type. On that perverse note, can't wait for the eventual Cherry Poptart parody review, whenever it materializes. "one about the comics, one promoting the upcoming cartoon"
Upcoming cartoon? But the blurb said it came out last December. Whoop! Missed that when I was proofing. As a kid, two of my favorite action figures were the ones of Panda Khan and Usagi Yojimbo. Kind of ironic, especially because in my mind the two of them were meant for form a team with Sewer Samurai Leo, as a splinter group of blue-clad mutant samurai. I never imagined the Turtles would meet Batman sooner in any kind of media than Panda Khan. What short comics were included in these books? Any with creators/characters we'd know about?